In the last few years, mid-range smartphones have become so good in terms of design, camera, and performance that they are successfully luring customers away from premium devices. Chinese vendors Oppo and Vivo both have done a terrific job at offering beautifully designed and feature-packed smartphones at mid-range prices. 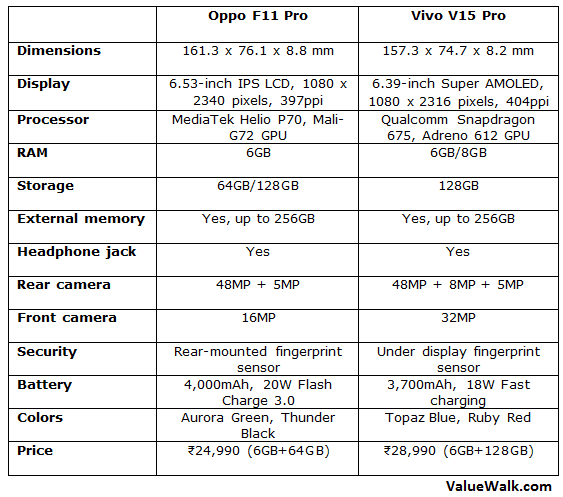 Oppo’s latest F11 Pro and Vivo’s V15 Pro have garnered immense praise from experts. If you are torn between the two, this Oppo F11 Pro vs Vivo V15 Pro comparison could help you decide which one is better for you. Both smartphones have a notch-less and nearly bezel-less design. Oppo and Vivo have used pop-up selfie cameras to ditch the display notch and expand the screen real estate. While the V15 Pro has the pop-up selfie camera in the top-right corner, Oppo has placed it in the top-center. The camera pops up whenever you need it. Both the handsets retain the 3.5mm headphone jack. The rear panel of both phones is made out of sturdy plastic with beautiful gradient colors that give the phones a premium feel. The V15 Pro gets a triple camera on the back while the F11 Pro features dual rear cameras. You can also see a circular fingerprint sensor on the back of Oppo F11 Pro. Vivo has used an in-display fingerprint reader, which is far more convenient than the rear-mounted fingerprint sensor. The F11 Pro comes in Aurora Green and Thunder Black colors while the V15 Pro is available in Topaz Blue and Ruby Red color options. The Vivo device measures 157.3 x 74.7 x 8.2 mm and weighs 185g. In contrast, the F11 Pro measures 161.3 x 76.1 x 8.8 mm and weighs 190g. The Vivo V15 Pro has a superior display compared to its rival. It features a 6.39-inch Super AMOLED panel with Full HD+ resolution of 1080 x 2316 pixels. It has a 19.5:9 aspect ratio, 84.2% screen-to-body ratio, and 404ppi of pixel density. The Super AMOLED screen delivers more vibrant colors that LCD panels. Just like V15 Pro, the Oppo F11 Pro has a full-screen design with a tiny chin at the bottom and no notch. It features a slightly larger 6.53-inch IPS LCD panel with 1080 x 2340 pixels resolution. It has a 397ppi of pixel density, 19.5:9 aspect ratio, and 84.4% screen-to-body ratio. Both the phones offer an immersive experience while playing games or watching videos. Considering the price point, both phones have incredibly powerful hardware. They both allow you to switch between multiple apps without any lag or play demanding games. The Oppo F11 Pro runs octa-core MediaTek Helio P70 processor paired with Mali-G72 graphics processor. It comes with 6GB RAM and 64GB of internal storage. Some countries also get a variant with 6GB RAM and 128GB storage. The phone supports external memory of up to 256GB via a microSD card slot. The V15 Pro runs Qualcomm’s octa-core Snapdragon 675 processor, which is slightly more powerful than the MediaTek Helio P70. The Snapdragon 675 offers great value and performance. The Vivo phone packs 6GB or 8GB RAM and 128GB of internal storage. It also has a microSD card slot for external memory of up to 256GB. In terms of battery, the F11 Pro packs a giant 4,000mAh battery that should easily last more than a day of normal usage. It comes with 20W VOOC Flash Charge 3.0 technology for fast charging. In contrast, the V15 Pro features a 3,700mAh battery with 18W fast charging. It promises up to 24% charge in just 15 minutes. Both phones rely on micro-USB port for charging. Both F11 Pro and V15 Pro run Google’s latest Android 9 Pie software with a custom skin on top. The F11 Pro is one of the first Oppo devices to run the ColorOS 6 skin. The V15 Pro runs Vivo’s custom Funtouch OS 9 interface. Both devices have garnered a lot of attention because of their camera capabilities. The Oppo F11 features a 48-megapixel primary lens with f/1.8 aperture and a 5-megapixel depth sensor with f/2.4 aperture. For selfies, it gets a 16-megapixel Rising Front camera with f/2.0 aperture. It comes with the Ultra Night Mode, Dazzle Color Mode, AI Scene Recognition, and Beautification mode to deliver perfect images. The Vivo V15 Pro has a triple camera system on the back consisting of a 48MP primary lens with an f/1.8 aperture, an 8MP wide-angle lens with an f/2.2 aperture, and a 5MP depth sensor with an f/2.4 aperture. For selfies, the phone gets an impressive 32MP pop-up camera that comes up whenever you need it. The rear camera supports AI Body Shaping, AI Portrait Lighting, Beautification mode, and other selfie-centric features. Both the F11 Pro and V15 Pro cater to the mid-range segment, and have been priced accordingly. The Oppo F11 Pro has been launched at Rs. 24,990 in India for the 6GB+128GB variant. The Vivo V15 Pro is available in India at Rs 28,990 for 6GB+128GB model. For the additional Rs 4,000, the V15 Pro gives you a superior OLED display, a faster processor, an in-display fingerprint sensor, and a third camera on the back.